How much does a pre-listing appraisal cost? I get asked “how much does a pre-listing appraisal cost?” quite a bit. More and more homeowners these days are seriously considering getting an appraisal on their home to help them price it correctly to sell. There appears to be a change in the mind set of many homeowners from several years ago when the market was appreciating at such a rapid rate. Many sellers would price their home at a very high level due to high demand and most of the time the home would sell fairly quickly, but in today’s market, this is not the case. Competition for buyers is stronger and it is very important to list your home for the correct amount to move it as quickly as possible and to help reduce the likelihood of it not appraising for what it needs to for the mortgage. In addition to homeowners, real estate agents have been ordering more pre-listing appraisals recently. This is due to changes in the real estate market that make it difficult to pinpoint an accurate listing price. Unique homes or homes in remote locations also make it more difficult to price due to limited comparables. 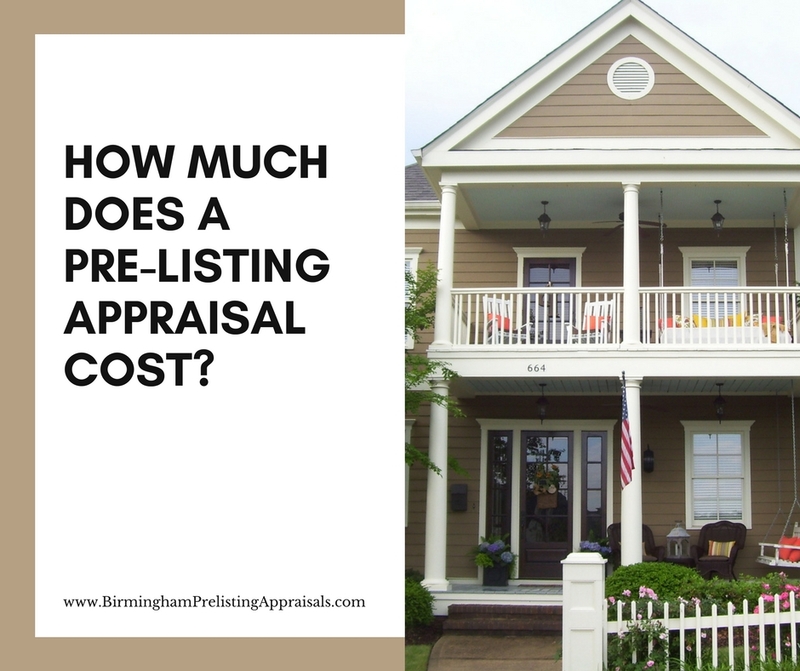 Because more and more homeowners and agents want to have an appraisal done they are curious about the pre-listing appraisal cost. Generally speaking, an appraisal can cost anywhere from $350.00 to $700. There are various factors that go in to quoting an appraisal assignment so I thought I would share with you what I look at when deciding on the fee. I would like to add that in addition to property specific items there are other considerations that determine the appraisal cost that you might pay if you were going through a lender who uses an Appraisal Management Company (AMC). Let’s first look at property specific information. Location- The location of the property can affect the difficulty of the assignment. Rural properties typically require more work because the number of comparable sales is different than a suburban home in a subdivision where sales occur more frequently. Obtaining sales information call also be more challenging if private sales make up a large part of the market. Sales that occur through multiple listing offices are easier to track down than private sales because they are easier to verify. The remote location of a property can also result in a higher appraisal cost because there are more job-related expenses. Size- Large, custom built homes take more time to measure and inspect. Depending on the size of the house, and other property improvements, an inspection can last anywhere from 30 minutes to several hours. A one level 1,200 square foot home on a subdivision size lot will require less work than a large 5,000 square foot custom built house on 10 acres with a guest house or barn. because of the possible influence on value. Type of Property- The appraisal cost for different types of properties can vary. This is usually related to the complexity of the assignment. Property types include the following: single family residences, manufactured homes, modular homes, log homes, and multi-family residences (duplexes,etc.). Depending on the real estate market, data may be limited and this could result in additional time and effort. Non-Property Specific Reasons For a Higher Appraisal Cost- As I mentioned previously there is another reason that a homeowner might pay a higher fee for an appraisal and that would be whenever an Appraisal Management Company (AMC) is involved. This would only occur when they are getting a loan from a bank or mortgage company. Several years ago government legislation required a third party to get involved so that communication between the loan officer and the appraiser would be reduced. This was supposed to reduce potential pressure on the appraiser by lenders. While it was possible for non-commission employees within the bank or mortgage company to perform this task, many companies outsourced this job to AMC’s, which ended up costing the consumer more money. The only reason I include this information here is so the homeowner will better understand the difference between what their loan documents say they actually paid for the appraisal and what the appraiser says he got paid. Some AMC’s will add their fee on top of what the appraiser gets and increase the appraisal cost to the homeowner, which can result in the “appraisal” fee increasing by several hundred dollars. As I said, there are multiple factors that go into quoting an appraisal, so if you would like a specific quote on your own property please give me a call. I would be glad to speak with you about it and answer any questions you have. If you have any real estate appraisal related questions you can call me at 205.243.9304 or contact me using the form below. Tom Horn is a valuable asset to the Birmingham real estate community. Tom's wealth of knowledge on real estate appraisals is second to none, just read his blog. Do yourself a favor and make Tom your go-to real estate appraiser in the Birmingham area. Thank me later! Tom Horn was quick to respond to my request to have a home's square footage measured. He can out the next day and had the report to me by afternoon. Outstanding Customer Service! I would highly recommend Tom Horn! Great experience with Tom. Reasonable pricing and fair time frame. This was not your typical piece of property, and not the easiest to comp. However, we felt like we received a sound value and were able to use the appraisal to market the property effectively. Tom helped me out when I needed an appraisal of a residential home! He was perfectly clear in communication, and gave us a quick turnaround! Thanks Tom!